I was healthy and not on any medication. I am thankful that I have been in a good place over the past few years. I went off medication nearly immediately after my surgery in 2012 and have not gone back on anything longterm since that time, so there are fewer complications from that to consider. My recent blood work shows that all of the markers that are monitored in individuals with Crohn’s disease are within the range that they should be and I’ve felt great for the vast majority of the past three years. I also have only had two major surgeries, and both of these were done laparoscopically, so they were minimally invasive and less likely to produce scar tissue. So essentially, I knew that I had lower risk of issues with the actual pregnancy, while at the same time knowing I am in a good, healthy place to be able to care for another person. I did not want Crohn’s to take this from me. Crohn’s disease has taken a lot away from me over the years, and this was something that I was firm on not wanting to give up. 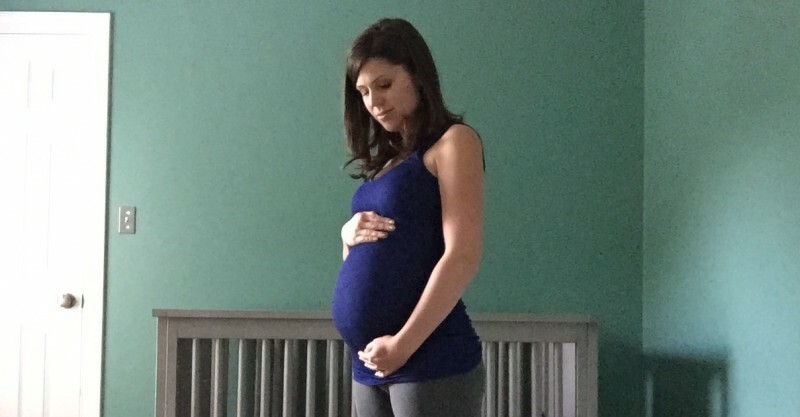 I was very aware that pregnancy might not happen easily or me, or at all, and my husband and I were prepared to explore other options if that was the case. But I did not feel that I could give up my dream of being a mother because I’m living with IBD. I just couldn’t let it have that, too. And I don’t think any man or woman deserves to be told that they shouldn’t have kids because of an illness. These people have already compromised enough in their life that if they desire to be parents, I don’t think anyone has a right to tell them otherwise. We don’t know what causes IBD. And therefore, we don’t know how it is passed on. While studies have shown that people who have an immediate family member (parent or sibling) with IBD are more likely to be diagnosed with IBD, we don’t have any solid genetic evidence of it being hereditary or explaining why one child might have it and another does not. What I really mean by this is that we don’t currently have a particular gene or hereditary marker that we can test for and know if it will be passed along. Still, many people who are diagnosed with IBD do not have any family members, immediate or otherwise, with the disease, so we know it’s not a strictly hereditary disease. I hope that this is something we continue to find out more about and can better prepare us for making sure our children have the best chance of leading a healthy life. I have faith and I do believe in God. However, I do not believe that God gave me Crohn’s disease. I think that sickness and disease are simply a byproduct of the society in which we live. But I do believe that God has used this disease to shape me into the person that I am and has helped me to still lead an amazing life even with this disease. So I pray every day for this child to never know what it’s like to live with Crohn’s disease, but even if he does, I know that God will help him through, just as he’s done for me. I never wished I wasn’t born. I have been through some really tough times and some depressing times, but I have never once thought that I wished my parents had never had me. I love my life and I would hate to think that my parents would have considered ending it before it even began simply because I would have Crohn’s disease. Even if my parents had been told 100% that their next child would have IBD, I hope they still would have had me. So how could I not offer the same thing to my child? And while I know it would be one of the most difficult things I would ever have to deal with if I found out my child had Crohn’s disease, they would have the world’s biggest advocate in their corner, who would be there to help them through it, every step of the way. You’ll be the best parents !!! Thanks for writing, I’m going to share this with my pregnant daughter! She herself was born with Hirschsprung’s Disease. It is also a bowel disease, present at birth whereby certain nerve cells are missing from the intestinal tract. Please help raise awareness of Hirschsprung’s Disease (HD) to new & expectant parents by sharing on your fb page. HD affects 1 in 5,000 live births. The major symptom is that the infant fails to pass meconium within 36-48 hrs. Ongoing chronic constipation, diarrhea, bloated belly, vomiting bile are also major symptoms. Due to lack of HD awareness, our daughter was misdiagnosed fo 6.5 mos. At that point, the surgeries required were an ileostomy, bowel resection, pull-thru & reversal all before Age 1. Recently we learned scar tissue was interferring with fertility but happy to say that she is in her 2nd trimester now! It’s believed there can be a hereditary component to HD, but our attitude on life is the same as yours. Good luck! You have a great attitude and I admire you for it. I am 51 and have had Crohns since age 17. I have worked in the medical field for 20 years. I spent time in GI, with with my GI and counseled many IBD patients. For the longest time I got along well with various meds. But about 4 years I started having issues. I had several surgeries since 2012 and an Ileostomy a year ago. I have had a lot of problems and have a wound vacuum for 14 months. Your website is encouraging. I read that you are in Raleigh, NC. I lived there until last year when I had my Ileostomy. I worked at Wake Internal Medicine. I think this is brilliant. I have Crohns and I have a 9 year old boy. At the time I fell pregnant my crohns had been up and down and mostly controlled by steroids as I am intolerant to all other meds. I was also on the pill and not trying for a baby. But I fell pregnant and was so well through my pregnancy other than pregnancy related issues. I have a healthy strong vibrant little boy who has seen me at my worse and been with me at hospital after surgery for my resection. He is the most amazing little boy and wants to know everything that is going on when I’m poorly. He’s so inquisitive. I have bought him up on my own too he has no contact with his father. I don’t for one second think that having Crohns should stop anyone following a dream to have a child although yes there are risks but there are with everything in life. If we didn’t take risks where would we be. I would happily have another child even if I was to bring them both up on my own. I work full time and am at college. But I still make sure I spend time with my boy and coach his football team too. My Crohns is unsettled at the minute due to other medical problems but I am determined to carry on with my life and won’t let it beat me. I worry Everytime my son says he has tummy ache or runny poop. But I monitor him and look out for early warning signs probably being over cautious but the chances of him having Crohns is slim to none but it is still in the back of my mind. Stephanie….wonderful thoughts and there are certainly no guarantees that come with having children, either birthed from our bellies or adopted. That also goes for having a disease like ulcerative colitis or Crohns. I had UC for 10 years, followed by an ileostomy surgery. I became pregnant after the surgery, (four times, 2 miscarriages as well), which I never thought would be possible. My children are now 15 and 17, with no signs of UC. Thank you God for giving me this gift. I feel blessed to have been given the gift of being a parent. I am defined by being a woman, daughter, friend, sister, wife and parent, not by having a disease! Thank you for sharing your story, Lauri. It touched me. I have had UC for 9 years. I have been on SCD very strictly for 5 years now. While my flares no longer hospitalize me they still limit me significantly. For the past 6 years I have had urge incontinence. I struggle with this daily despite a very strict diet. I haven’t been able to work or go to school. It’s a miracle that I met my husband! I am now seriously considering an ileostomy so I can take back control of my disease and have a life… Anyways, I was wondering why you have decided to start the SCD now that you no longer have a colon? Do you still have symptoms and if you dont mind sharing, what are they? I thought that after an ileostomy people with UC have more freedom with diet and very few, if any, symptoms? Thank you for this wonderful posting! I know how fortunate I am to have three children, but it was a long road for me to get there. In the midst of it, I was asked by well meaning people, “Should you have children? Why would you want to pass along this illness?” That always hit me like a ton of bricks. No one should feel they have to defend their choice to have children. Hello there my name is Shannon, im 44 an a mother of 3. I was diagnoised in the year of 2001 with Crohns. When i became pregnant I was not diagnoised nor did I have any major symtems, until I was around 7 mo along I started having stomach pain, cramping, an noticed I was having a little blood & mucus when I went #2. Then I got gas,with mucus an it was quite smelly. Sorry but im sure you all are familiar. Lol. So when I went to my Baby Dr. I had told him about what I was experiencing, I was told that alot of my symtoms were all normal, like the blood while going to the rest rm was probably from a hemroid, since many woman while pregnant get hemroids,with blood from straining an mucus & gas norm, an having cramping is very normal, I was pregnant my first time,not knowing what to expect. So I took note of it all an had my baby in March 2 wks over due, an it turned out she was sideways, around 9-10 pounds. So after trying for 14 hrs to have her an my Dr. Trying to turn her just wasn’t gonna be happening for me that day, I was told that I was going to be taken in for a Csection. I was pleased with those words by then cause my pain in my back was over whelming. So All was well 10 pd girl healthy, an I was fine. So for the next 4 mo my symtoms I was having while pregnant have progressed a lot. So When I seen my regular GP Dr. I explained what I had been experiencing an it seemed to get out of hand. He ran lots of blood test, poop test an nothing I was being tested for would come back negative. So He refereed me to a GI DR. For a colonoscopy rt away. Went in to have my test done an by then my symtoms where over the top. Pretty darn sick, An very scared, wondering what is wrong with me? Well by the end of my test, my Gi Dr. was standing there telling my mom what he seen, an by his expertise he was pretty sure he what he seen was #Crohns disease, an with the biopsy we will know for sure, along with a specific blood test will give us a answer to what ive been experiencing. I was kinda out of it after the test, being I was sedated, but I could put together that what im facing is a life long disease, Crohns. Never heard of it, didnt have any idea what I was facing, just thought wow this isnt good. Test came back a few days later positive an it hit me. So I just had my baby 6 mo prior, an symtoms got alot worse. So the next 3 yrs was hell. No remission just hell. Finally going into my 4th yr straight sick , I got a break. I had seen a herbalist dr. Who studied western meds & natrual remedies. I got a little better, each day an within 3 mo I felt great. So yes I wanted one more baby an took the chance, well While pregnant my 2 nd time I only got better in my health, stronger immune system along with no symtoms. I was very healthy during my 2 nd pregnacy an for the next 3 yrs. So when I was surprised by my 3rd gift from god, healthy once again this pregnacy. After my last pregnancy I was in full blown flareups for 3 yrs straight. Terrible times. Lots of hospital stays, ER visits, an sick. So I would have to say I myself was lucky to have healthy flare free pregnancies. I do think ever person is very different. Every flare is different also. I do think if you were already diagnosed with IBD, an perhaps if it seemed you never had remissions you may want to think being pregnant wouldnt be the best for you an your health. Perhaps foster or adopt. Or possibly take a chance, its your body, an there could be a chance your body might not be able to become pregnant. I know right after my last pregnancy at the age of 36, I stopped having periods, an havent since then. Straight into menopause. Id also think it be a very good idea to cryofreeze some of your eggs, just because you never know what may go on with the body. Plus if you could get a serrogunt to carry your baby that could be a great option also. Just never give up hope, God has a plan for all of us. May all you stay healthy & happy, an never for get to love yourself first, cause we only live once. Take care, shannon.